Life is a wonderful journey. Often the life path on which we walk can be made even more fulfilling and can become clearer through having someone walk with us, both in our individual lives and in our workplaces, groups and organisations in which we work or are involved. Some of our sisters are trained and experienced spiritual directors, facilitators, counsellors, psychologists and pastoral supervisors. Some offer retreats, meeting and conference facilitation, group and individual spiritual direction and pastoral supervision. 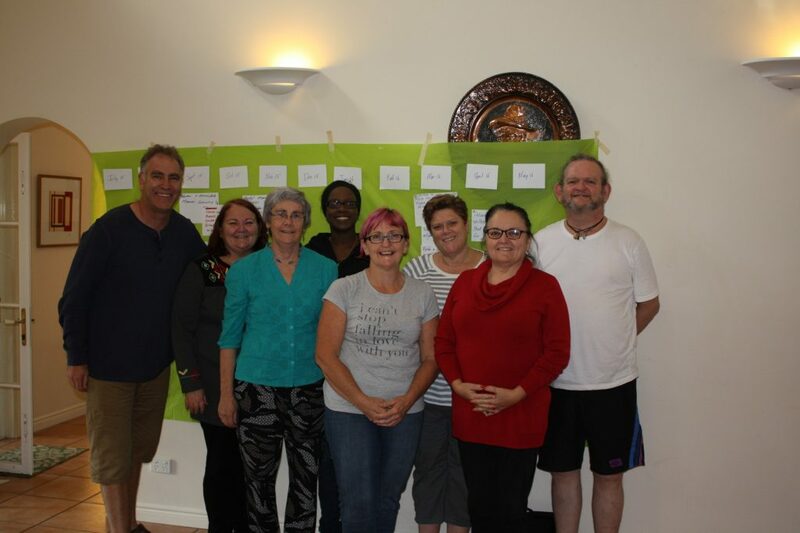 Facilitator Sr Margaret Endicott RSM (third left) with workshop participants. The Institute also operates a range of spirituality and retreat centres where individuals and groups can visit to withdraw from the fast pace of life to take time for prayer and spiritual direction or attend retreats and spirituality courses. One of our most important ministries is the ministry of presence, where we stand alongside those in need, volunteer in parishes, charity shops, asylum seeker organisations, offer pastoral care and visit those in poverty and those dying. It may mean standing with someone in the midst of anxiety and fear or just journeying with people through the ebbs and flows of everyday life. As Sisters of Mercy, our ministry is a lifelong 24/7 commitment to bring the merciful face of God to others.